Even though I’ve never heard of Estonia before seeing these images, the visual effect is enough to make me want to visit this obscure location in Eastern Europe. 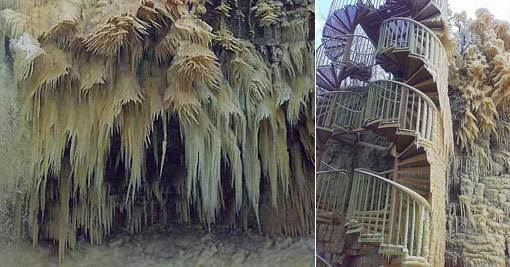 What they’ve done is created an artificial waterfall which has subsequently frozen around a tourist attraction of sorts. If the water looks dirty, it’s because the waterfall is created by redirecting a drainage ditch.Some of these icicles are over a dozen feet long though. At that length, they’re more like javelins. Some of the water still flows, but the rest formed staggering blades jutting out in every direction. Stuff like trash cans, staircases, and even an ice cream booth have been frozen over. Talk about a cold hazard! One ill-timed step could leave you slipping and sliding into the last winter wonderland you’ll ever see. Check out the video below if you want to hear a British guy make a joke about “Ice World Gandalf” or visit here for even more images.